I’ve spent the past 2+ years learning to accept that my “mental illness” is an inextricable part of me, while also working to unlearn the distorted beliefs and once-adaptive behaviors that keep me from fully expressing my true Self. One of these beliefs is perfectionism, particularly when it comes to playing guitar and piano in class: I believed I had to conform perfectly to academic, musical, and social expectations in order to be accepted by my peers. I have also spent my whole life trying to hide the fact that I (like anyone else, though perhaps sometimes to a greater degree) have times when I feel insecure, frustrated, angry, guilty, vulnerable, sad, anxious, confused, etc. ; that there are times when I don’t know what to do and times when I make mistakes. I did this throughout my childhood and adolescence to provide some stability to a family that often felt determined to tear itself apart. But it became overwhelming as an adult. Eventually I just couldn’t do it anymore, and I didn’t know how to function in society without doing it. So, I withdrew. At times I withdrew a bit too far, disappearing into video games. But, for the most part, I think the withdrawal was both healthy and necessary. It enabled me to prioritize my mental health above other concerns for the first time in my life. It required me to be honest with myself and those closest to me, in ways I’d never dared before. 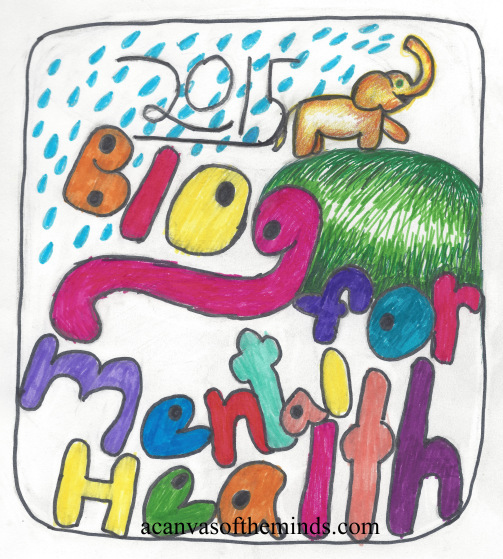 Blogging for mental health has contributed immensely to this process. This blog gives me a safe place to share my thoughts on topics I might otherwise consider taboo. Writing helps me get a better sense of what I’m thinking and feeling, to better understand what’s really happening beneath the sudden flashes of anger or crushing guilt or hurricane of conflicting emotions. (It probably has something to do with a distorted belief.) Sometimes I receive comments from other bloggers who offer support, congratulations, advice, encouragement, and the knowledge that someone can relate to my experiences. I can see that people are reading the blog (even if they don’t respond directly); my voice is being heard. And I have the opportunity to read about the experiences of other bloggers, to connect with them through comments, to feel a sense of community. So, elephants. I’ve come a long way on my mental health journey; I’m replacing my distorted beliefs (e.g. “I have to be perfect to be accepted.”) with more realistic ones (e.g. “It’s okay to let my imperfections show.”). I’m even trying out new behaviors, like telling my small group I’m not sure what to do or admitting to a classmate that I’m (also) terrified to play in front of our piano class. So far they seem not only to accept, but maybe even to like me. I think the next step is to be honest about my mood disorder in my everyday life, with people who know my legal name. 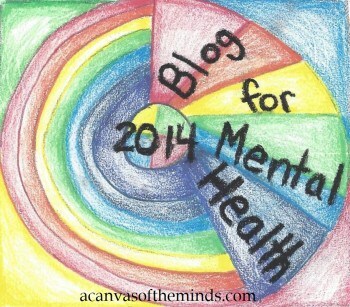 I won’t be as candid as I am on this blog, but it’s important to talk about mental health issues. I especially need to be able to do it in my music therapy classes, conferences, and (someday) my work environment. I want to help create communities of mutual support, where talking about mental health issues is the norm and it is safe to be genuine. Not only does talking about mental health issues give others permission to do the same – which could save a life – but it has been and still is a safety issue for me. I need to be able to say things like “that was triggering for me,” “I’m not role-playing anymore; this is how I actually feel,” or even “I need a break from this, can someone come out to the hallway with me?” When I speak up and receive support from someone else, my emotions and destructive thoughts can’t overwhelm me. I feel better about, well, everything.